DOT / CDL Physical Exams, 30 years experience. Bus/Tractor parking on Kettleman Lane (Hwy 12) 0.7 miles South. Tractor-trailer parking is available in Lodi near DMV, East of Hwy 99 and North of Hwy 12 as shown below. Bring most recent lab reports, if any, name and dose of any medications. If you have sleep apnea and use a CPAP breathing mask, have your doctor or supplier generate a “CPAP compliance report” and bring the original sleep study report if available. We take care of your DOT Medical Card process and get it done right the first time at businessname! Serving California local areas: Lodi, Galt, Stockton, Elk Grove, Sacramento, Modesto, Central Valley, Delta, and Gold Country. 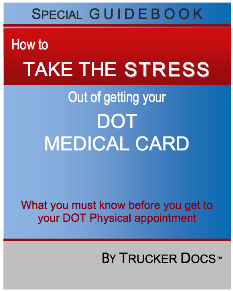 Bookmark this page to Occupational Health Services for your DOT physical exam.